Not only is Medora rich in history and culture, this Badlands town is a gateway to Theodore Roosevelt National Park, where bison, elk and prairie dogs roam, and the president's cabin still stands. Theodore Roosevelt National Park has sites related to the 26th president like the Maltese Cross Cabin, where he lived for about a year before moving to the larger Elkhorn Ranch nearby. At the cabin, visitors can see his trunk, a replica of his writing desk and other period antiques that give a sense for how it looked when he was there. You might spot grazing bison in the visitors' center near Painted Canyon. Check out the technicolor rock formations from the overlook, then drive the Scenic Loop, which takes about 90 minutes and passes several other panoramic vantage points and prairie dog villages. Named for Roosevelt's volunteer cavalry, the Rough Riders Hotel is housed in a simple, two-story building in the middle of downtown. Accommodations are simple and comfortable, and room 501, which Roosevelt supposedly stayed in, has an elegant four-poster bed. 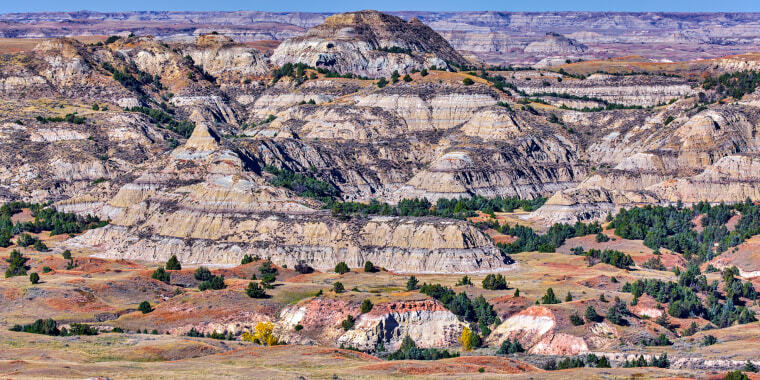 Drive northeast from Medora for about two hours and you'll reach New Town on the Fort Berthold Indian reservation, which is home to the MHA Nation, or the Three Affiliated Tribes of the Mandan, Hidatsa and Arikara. To gain a deeper appreciation and understanding of Native American culture, visitors can book lodging at Earthlodge Village on the shores of Lake Sakakawea. They'll have the chance to sleep in one of these structures, which are considered sacred, as well as participate in a trail ride and visit the nearby museum. Bison osso bucco and prime rib are two of the specialities at the clubby, wood-panelled Theodore's Dining Room in the Rough Riders Hotel. Need to fuel up before a trail ride? The Cowboy Cafe is known for its tasty, reliable breakfast dishes like eggs, french toast, hash browns and homemade caramel rolls.